Make it a dance to remember. Take the floor with confidence and create a lasting memory of your first dance together as husband and wife. You can do it. And, it does not need to be expensive. 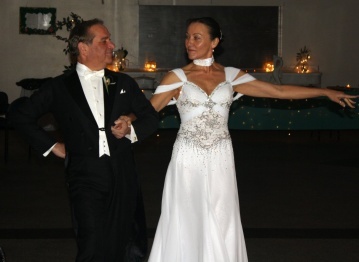 National Ballroom Championship Competitors John & Penny DeFino. Learn not only the basics for your first dance together, but the styling tips and technique used by ballroom competitors to win National Titles. Learn basic steps to insure confidence on the dance floor for your selected dance. Minimum three, one hour lessons. Simplified choreography. Dazzle your attendees with your newly acquired dance ability and special choreography. Minimum six, one hour lessons over a 60 day period. Don’t just dance, perform. Make a truly lasting impression as you exit the floor and leave your guests speechless. Choreography designed especially for you. Minimum tweleve, one hour lessons over a 90 period. Let the whole wedding party in on the fun. Provide a one night, two hour lesson to teach the basics of one dance. Your guests will float across the dance floor with confidence.